It’s a bit off the beaten trail. My Lonely Planet Eastern Europe book didn’t even list it, and it takes at least 5 hours to get to by train. (However, that says more about the speed of the train than the distance… It goes pretty fast to Bialystok, which is about two-thirds the way there, then turns into a local train that goes much slower the rest of the way. Plus they have to change the engine at a certain point because the tracks are no longer electrified.) But I had a particular reason for being there. But either he still didn’t understand, or there has been no change in the last year, because he just kind of shrugged. Probably it was some combination of both, I think, because later in the conversation when I asked him about the economy directly he said it was bad. “It was a lot better under socialism,” he added. He was mostly making reference to employment, though, and I can imagine that it may have been true, and that once the government stopped being the economy and everyone had to play the capitalist game it was difficult for everyone to compete. On the other hand, I suspect that with the EU connection there are now more EU-funded enterprises and projects, and it may in fact be easier for local businesses to compete in Europe than it was without the EU membership. The taxi then took me to my hotel. It was a perfectly fine hotel for my purposes: clean, cheap, comfortable. It even had a TV, and for the first time since I’ve been in Europe I watched a little. Mostly a BBC World Report on guinea worms in Africa (grotesque human parasites that can be at least 10 cm long that painfully bore themselves out of people’s legs) and a French program where it tracked a Chinese au pair as she settled in with (and apparently immediately fell out with, although for reasons that went unexplained) the family she worked for. I didn’t watch any German TV, but I did get some practice speaking it that evening. When I was checking in earlier I realized the men behind me were not speaking Polish but German. “Are you German?” I asked them, in German. They were. They were also very nice, and later that evening joined me at my table for dinner. I was nearly done eating when the men came in but I stayed while they joined me at my table. While they ate we talked, about 80% in German. It’s amazing what struggling in Polish does to my confidence in German. I keep thinking to myself, “You know, I could say what I needed in German…” The men were there because there was a narrow-gauge train in the area, and they were train buffs. (Or “trainspotters,” as I guess the British term would be.) The hotel gets a lot of visitors, from Poland and greater Europe, who come to enjoy the region’s many lakes and forests. I wasn’t there for them though. 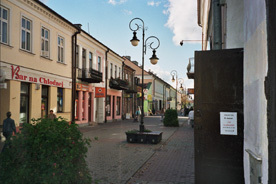 The reason I was there is because a part of my family came from Suwalki. The Gellis side, in fact, including the great-grandmother for whom I was named. The story goes that when she was a young teenager some Russian soldiers made a pass at her, which led to her being expeditiously married off to my great-grandfather. They then had many children, a few while still living in Suwalki and the rest (including my grandfather) after emigrating to New York. Throughout the day, as I was wandering around the town, I found myself looking at everything and wondering how much of it the first Chaya Gellis had also seen. 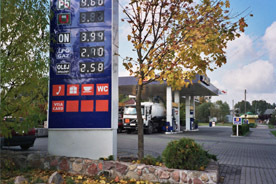 Certainly not all of what I saw: not the brand-new service station or freshly-laid brick sidewalks. Nor the communist-built hopelessly rectangular apartment blocks. 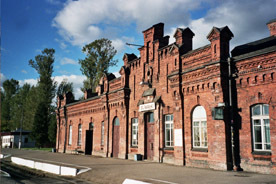 But possibly the train station, which was built in 1899. (She didn’t leave until 1905.) 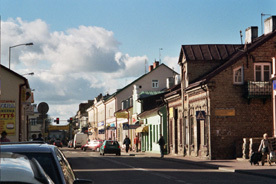 Suwalki also didn’t appear to have been greatly touched by war, and although a lot has changed because things were added, not so much physically seemed to have been lost. The original architecture along the main street, for instance, is probably the same that she might have passed by. 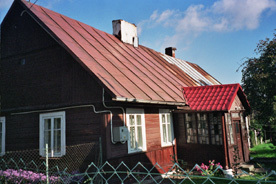 As were many of the low, wooden houses along the town’s periphery. However, something important has been lost since then. The first stop I made after leaving the hotel and walking around the small lake behind it was at the Jewish cemetery. 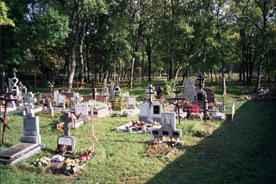 The cemetery in Suwalki used to be “in” the city, and as the city got larger it got moved “outside” of town. However, it’s a short and easy walk from anywhere in the town center to the cemetery. It is also divided into unequal thirds, with the largest portion being the gleaming immaculate Catholic cemetery. 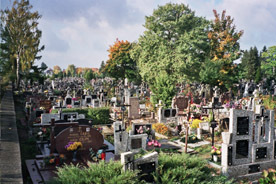 Another portion is an Orthodox cemetery, which although seemingly still in some limited use appears to be much larger than current needs would require. And then there is the Jewish cemetery, but the grave stones are mostly gone. Wave after wave of anti-Semitic attack has left most of the markers toppled, broken, or completely missing. Some effort had been made to rehabilitate the cemetery: some of the broken grave stones had been restored and formed into a large monument in the middle. There was also a smaller monument near the entrance dedicated to Holocaust victims. But other than a few clusters of graves here and there, the cemetery was but an empty field and a far cry from the adjacent Catholic cemetery, or even the smaller Orthodox one. It’s unclear whether anyone really still cared for this cemetery at all, although it’s not too overgrown. But it was clear that the waves of attacks desecrating the cemetery had not abated, judging by the piles of broken glass from smashed beer bottles near the monuments. It was everywhere, not just in one small spot. A shard even got caught in my shoe, and I could hear it clicking on the sidewalk as I walked away. And when we talk about what is missing from Suwalki we should realize that before the war there were 5400 Jews in Suwalki, yet on my visit I could not find a single surviving synagogue. Continuing on with my day I walked to the town center and main street, taking pictures of anything I thought might show my great-grandmother’s world to other relatives. I walked to the top of the street, turned right, went a few more blocks, and then ate lunch it what appears to be a brand new McDonalds. I don’t think my great-grandmother saw that… but mostly, I didn’t take a picture because it looks like every other suburban McDonalds. It did appear, however, to be across the street from a prison. After lunch I stopped by an Internet cafe to check my email, bought a few more postcards (my thinking with postcards is, “Why should I have to take all the pictures? Why not get a professional to do it?”) and then went back to the hotel. Actually, I didn’t go back right away. I walked a little past it to see what was beyond. But I was tired and didn’t go far. As I turned to go back the wind must have blown a glass bottle into the street, and a car immediately ran over it and broke it. Concerned that cars were going to get flats, I thought about finding a broom to clean it up. But that thought made me angry. If I was going to sweep up any glass, it should have been at the cemetery. Still, I made some effort to help and tried moving it out of the way with my shoe. But an oncoming car in the same lane, who could see me from a long way away (the street was straight, and I was uphill) refused to yield. So I had to, and as he passed he seemed to curse at me. The thought that immediately popped into my head was, “Fine! You people like broken glass so much? I hope you like it in your tires!” I couldn’t help but find the crunch of his tires as he rode over the glass somewhat satisfying. But as I said, I was tired by then. I’d walked a lot, and most of the people I met there were perfectly nice. Still, it was time to call it a trip, and I went back to the hotel where they called me a taxi to go back to the train. The train station built in 1895 (and in a different architectural style than the rest of the town). 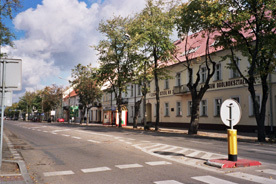 The main street, exhibiting the typical more neo-classical architecture found along it. What seems to be a typical old wooden house, of which there were many throughout the town (this one was across the street from the Jewish cemetery). 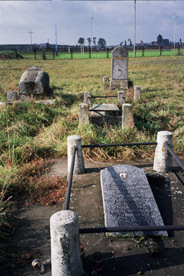 The Catholic cemetery with its gleaming polished gravestones. 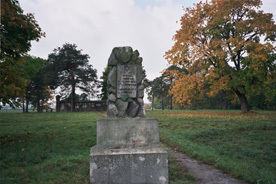 The Holocaust memorial at the front of the Jewish cemetery, with the field of now unmarked Jewish graves behind. 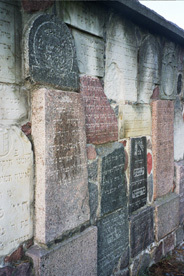 The few graves in the Jewish cemetery still in their original locations. Smashed gravestones now made into a central memorial in the Jewish cemetery. Not pictured, because I didn’t like how the photos came out: either of the two old churches in the downtown, the town square, or the ancient, abandoned Orthodox church. But attached are some zip files with additional pictures.